It seems third times a charm. 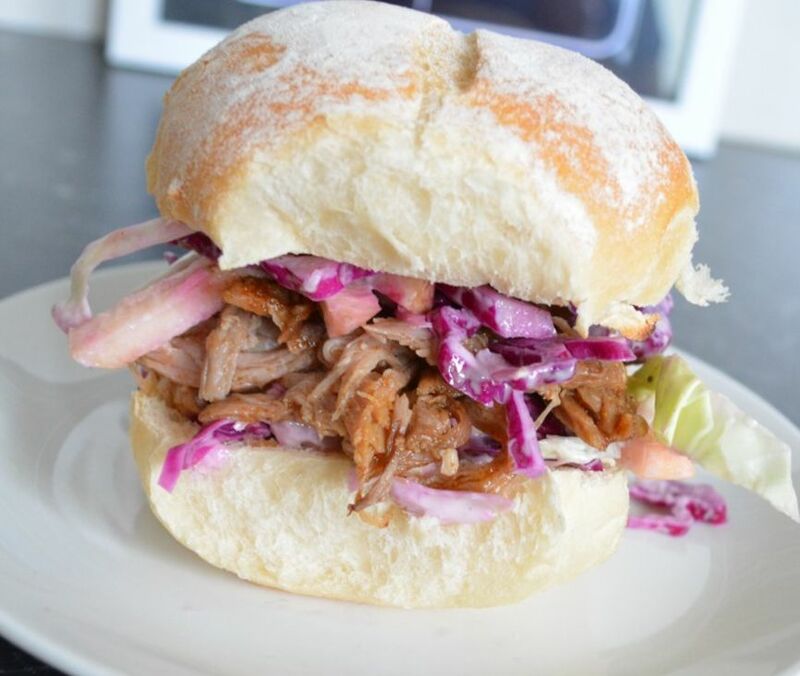 I have made this pulled pork recipe three times now and finally I am happy with the results. The first time I made it, I loved the spice mix, but after baking it as long as suggested, I had to tear it from the bone, it just wasn't perfect. The second time I made it, I was out all day and by the time I came home and took it out of the oven, it was dry and stringy. But gut instinct and cooking like my mum used to cook, the third time, the meat pulled away from the bone perfectly and was moist and juicy and delicious, and the bonus, it cooked in less time than the first two goes.. This pulled pork recipe for me always had the right spice mix, it was spicy when you bite into it, but it isn't too hot, but a few seconds later your lips tingle a little and you start feeling the heat. I loved it. My daughter complains it is too spicy, but keeps going back for more. My boys love it. The coleslaw is what cools down the heat, it is perfect with the pulled pork. I do two coleslaws, one with a oil and vinegar dressing and one with a mayonnaise dressing, why, because some of us like mayonnaise and some of us don't. The coleslaw recipes can be found at Coleslaw with a Mayonnaise Dressing and Coleslaw with a Vinegar Dressing. I have seen many, many recipes for pulled pork, I doubt I'll try any of the other ones as I love this one. Get your butcher to remove the skin for you, but don't discard make crackling with it. So if you are new to pulled pork or looking for a new recipe, I do recommend this one. We loved it, hope you do to. For the dry rub: Add all the ingredients in a medium sized bowl, mix well to combine. Store in an airtight container. For the brine solution: Add salt to cold water in a large bowl. Stir well until all the salt has completely dissolved. Add the brown sugar, 3 tablespoons of the dry rub and bay leaves. Stir well to combine. Pork Shoulder Preparation: Rinse the pork shoulder and place in a large container or large snap lock bag. Pour in the brine solution until the shoulder is completely covered. Cover the container (or snap lock the bag, and place in a bowl, in case of leaks) and place in the refrigerator for at least 8 hours, I like to leave it overnight. Heat oven to 150C/130C fan forced. Remove pork shoulder from the brine solution, pat dry with paper towels. ​Rub pork with 2 tablespoons olive oil. Heat a large non stick frying pan until very hot and sear the pork on all sides until golden brown. Place meat on wooden board. Sprinkle dry rub onto the surface of the shoulder and massage in such that it adheres to the surface. Coat all sides. Place the meat on a wire rack in a roasting tin, making sure the fat layer on the shoulder is facing up before cooking. Press on any remaining dry rub that fell onto the wooden board. Add 1 cup of water to the roasting tin, place a piece of baking paper on the pork shoulder, then cover very tightly with aluminium foil and bake in the oven for 5 hours or until almost falling apart. In the meantime, make the coleslaw. My recipes are in the links above. When the meat is done, drain the juices from the meat into a jug. Shred the pork using two forks, I like chunks, rather than strings of meat, discard the fat. Skim off the fat from the rerserved juices, pour the juices over the meat. (You could add a little flour to the pan juices to thicken it a little, if you like a thicker sauce). 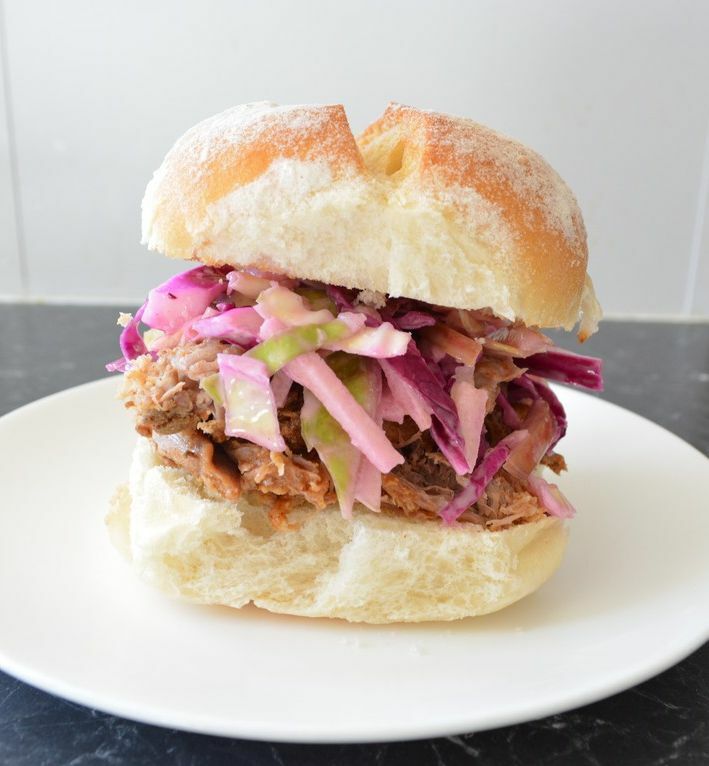 Serve the pulled pork with toasted buns and coleslaw. You can if you like, serve it with additional barbecue sauce.